The roots of Berlin’s Memorial Day Celebration began after the Civil War. Originally known as Decoration Day, it was established in May, 1868, by the Grand Army of the Republic (GAR) to strew flowers or otherwise decorate the graves of comrades who died in defense of their country during the Civil War. It was inspired by local observances of the day held in several towns throughout America that had taken place in the three years since the end of the War. Waterloo, New York, was declared as the birthplace of the event because the town had made it an annual, community-wide event in 1866 during which businesses closed and residents decorated the graves of soldiers with flags and flowers. The Grand Army of the Republic (GAR) was an organization of former Union soldiers and sailors organized in 1866 to strengthen the bonds of comradeship, preserve the memory of fallen comrades and give aid to soldiers’ widows, orphans, and handicapped veterans, and most of all, to fight for pension increases and other benefits. Sometime between June of 1884 and 1885 Berlin veterans formed #511 Post Tappen (named after Silas Tappen), and by 1890 the organization had reached its peak. In 1897, it was reported that Berlin celebrated Memorial Day with flags and bunting displayed in the streets and Post Tappen, Sons of Veterans, Odd Fellows, and Home Templars headed by Sheldon’s Band marched to the cemeteries and decorated the graves of veterans. A dinner at the First Baptist Church, with over 300 attending, was followed by a Memorial Service. In the afternoon there were various races and a ball game between a team from Williamstown and the home nine which Berlin won 16-1! Memorial services were often held in various churches of Berlin after decorating the graves and other activities. Some years the school children carrying the flowers and, headed by the band, marched to the Seventh Day Cemetery where local ministers said prayers and a flag and floral tribute was placed upon the grave of each soldier. After these exercises, teams of horses and wagons would carry the old veterans to the Center Berlin Cemetery to decorate the graves. The Taconic Inn in 1912 as the crowd begins to gather for Memorial Day. 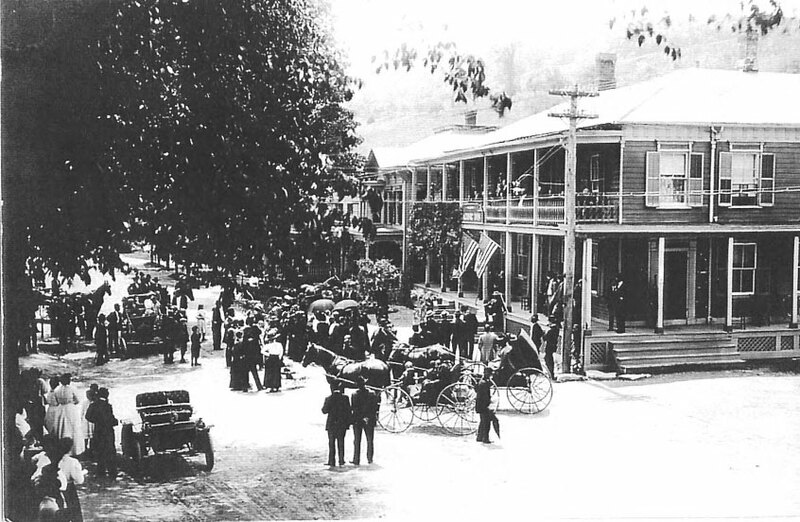 By 1912, as shown in the photograph, the procession was returning to the Taconic Inn (better known to us as the Colonial Inn) on Main Street where a memorial address and prayer were offered to the large audience standing in the street. Howard Tracy read Lincoln’s illustrious Gettysburg Address and Rev. Roberts of the Methodist Church gave an “eloquent patriotic address” in the morning. The newspaper clipping from that event goes on, “The roll of names lessens yearly and before many years have passed the last remaining veteran will have gone over to the eternal camping grounds. Berlin’s Roll of Honor—Alfred E. Tracey, James E. Winn, Leonard L. Lewis, Stephen B. Chapman, Jet N. Stillman, George Grant, Frank U. 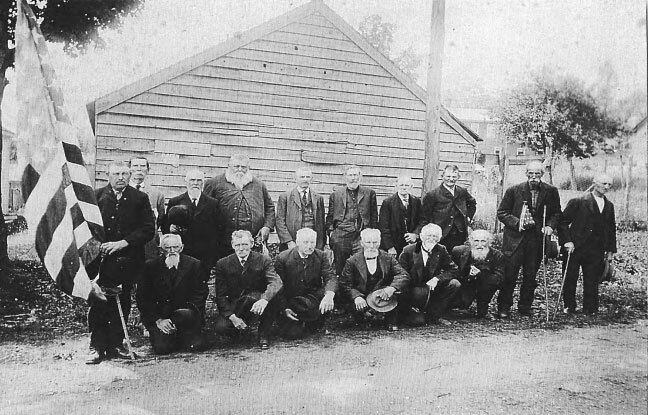 Brown, Morris Broderick, Fritz Mulson, Charles Busher, Ira Grant, Lester L. Cowdry, Samuel Bentley, Amzi Hill, Hiram Main, John Loker, Edward Rhodes, and W. E. Hull. Members of the G.A.R. in 1910 are front (l. to r.) Leonard Lewis, Will Hull, Ed Winn, George Grant, Charlie Busher, Henry Lott; back: (Standing) Morris Broderick (holding flag), Jet Stillman, Sylvester Cowdry, Eleazor Reynolds, Alfred Tracy, William R. Lewis, Edward Boesse, Amus Hill, Israel A. Mason, Edward Rhodes. The picture was taken in front of the shed which was behind the First Baptist Church. The last encampment of the GAR was 1949 and the last member of the national organization died in 1956. The celebration took place across the country on May 30 of each year until 1971 when most states changed to a newly established federal schedule of holiday observance. The American Legion Post #937 in Berlin has carried on the tradition of this parade. The parade is composed of veterans of our wars, the school band, and other organizations marching to the monument in the center of town where there are prayers and a short speech. A floral wreath is placed at the monument which honors Berlin veterans of all wars. The parade then continues on to the Seventh Day Baptist Cemetery where there is a gun salute and taps is played. Veteran’s graves in both Berlin cemeteries are adorned with flags placed there by members of the Legion. I, for one, am grateful that this tradition of long standing honoring those who have fought to keep us free continues to exist.